I must confess that as a young West’s fan Tony Ford was one of the main reasons I went back to see West’s play week after week. Greg and I would get to the ground before third grade started just in case Tony Ford was playing early. Those were the days before the fans had any knowledge of who would be playing in the lower grades. Tony was quick on his feet, had a side step as good as Langlands, his kicks for line were always worth 30 yards (that’s a bad one) and his place kicks for goal had to be seen to be believed. One wet day at the old Sydney Sports Ground I saw Tony kick a very wet leather ball over the black dot from half way. His record speaks for itself. Tony played 104 first grade games between 1967 and 1974. Tony scored 7 tries and 317 goals. That’s a total of 667 points in first grade alone. We must remember that Tony was not always the first choice kicker. The ball was sometimes thrown to players such as Dave Barsley, Peter Flanders, Barry Glasgow, and Don Parish. 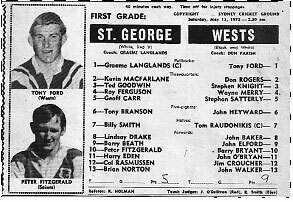 As a matter of fact Tony had his first grade debut against Parramatta in 1967 at the age of 21. West’s lost the match 14-11 and the West’s goal kicker that day was…..the late John Armstrong…..he kicked 4 goals. So not only was Tony competing against fellow backs but also second rowers. . I think by now you can work out that I was really looking forward to meeting and interviewing Tony. So as Bugs Bunny once said, "so on with the show this is it ." Tony was born in 1946. He spent his early years around the Strathfield area and went to Homebush Boys High. It was at Homebush High that he met Terry Begnell and decided to play Rugby League on the weekends for Enfield Feds. Terry was the son of a great old West’s man, Jim Begnell. Tony was already playing Rugby Union for his school during the week. Believe it or not Tony was 15 years old before he played his first game of Rugby League the year is 1961. 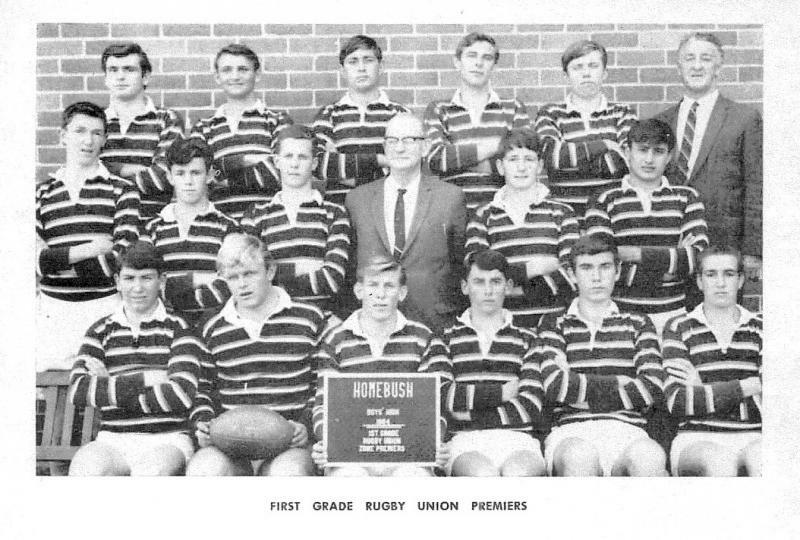 In the 1964 year book from Homebush Boys it is written. in all representative games during 1964. His 110 points for the school in 10 competition matches created a Zone and C.H.S. record. On the New Zealand tour with C.H.S. his brilliant goal kicking, many from over the half-way mark, earned him the name "Boots" from Don Clark. New Zealands famous goal kicker. Footnote: Don Clark played 31 Test matches from 1956 to 1964. 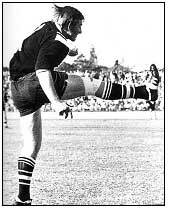 Don was known as "The Boot"
During his All Black career Don scored 781 points. If you have the time go to You Tube and type in Don Clark New Zealand. Good stuff. 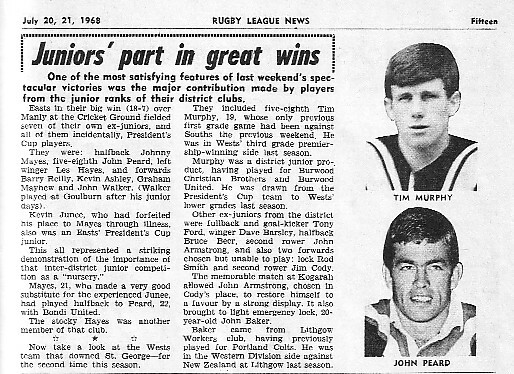 Some of Tony’s fellow junior players were Bruce Beer, John Armstrong, Tim Pickup, and Frank Tagg. Tony played in the fullback position for his entire football career. Except for a few odd occasions when he played centre. “I loved to tackle, so playing in the centres was ok, I once marked Big Mark Harris that was fun” Tony also played centre in the game in 1968 when West’s played France at Lidcombe Oval. Next time I see Noel Kelly I must ask him why the positional move for Tony!!. Back to 1967…. Don Parish who had been West’s fullback since 1961 had a major injury this gave the young fullback from Enfield Feds his chance in first grade. Don left West’s to captain-coach Wollongong West’s at the end of the 67 season. This move gave Tony a more permanent fullback spot in 1968. It’s hard to remember those old days at Pratten Park when all 3grades trained on the same night at the same time. Tony recalls the training methods of that era. “Never did like training, would rather play any day." We would run around Pratten a few times to warm up then a game of touch followed by ball work total time about one and half hours, then hit the showers”. 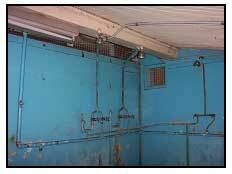 He smiled when he spoke of the dressing rooms at Pratten. Tony’s favourite ground to play on was the Sydney Sports Ground. It was a ground were years earlier he played fullback for Combined High Schools. 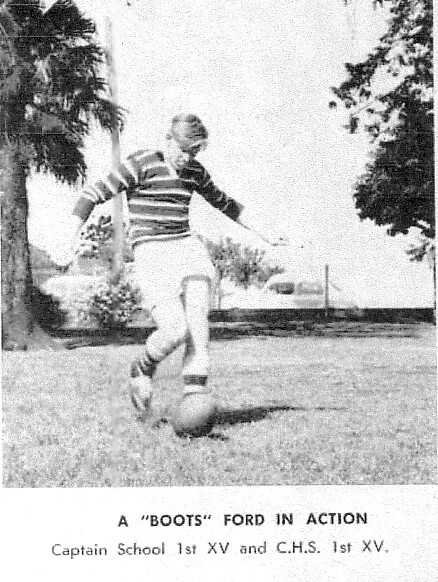 During his Rugby Union playing days Tony toured New Zealand in 1964 with the New South Wales Combined High School Open team. They were undefeated during this tour. One player in this team was Phil Smith. Phil played 8 Rugby Tests for Australia before turning professional and signing for South’s in 1971. Tony loved playing football and was lucky enough to play with and against some of the best. 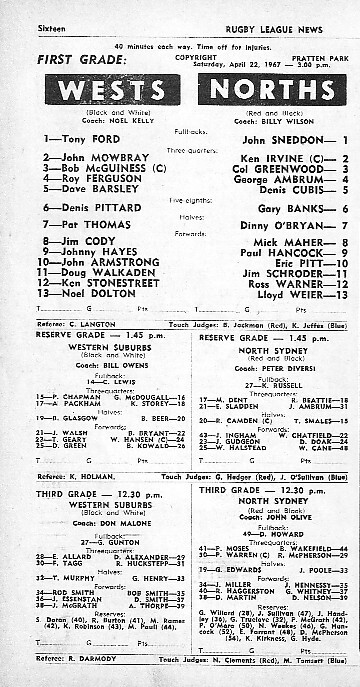 West’s players include Ken Bray, Bruce Beer, Dennis Pittard, Noel Kelly, Jim Cody, Chow Hayes, Dave Barsley, Barry Bryant, and Mick Alchin etc. Fullbacks that Tony had great some great tussles with were Keith Barnes, Les Johns, Graeme Langlands, Bob Batty, Eric Simms, and Ken Thornett. Best players for West’s Tommy Raudonikis, John Elford and Russell Mullens. Best players from other teams Billy Smith, Mark Harris and George Ambrum. 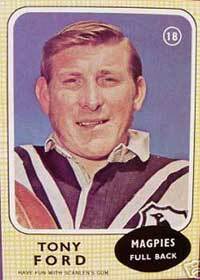 Tony was offered a contract from Manly in 1967 and also Newtown in 1970. He felt that playing for West’s and being loyal to his teammates was more important. During his last 4 years at West’s Tony played for a $5000 sign on fee plus $60 a win and $40 a loss. The write up below says it all they were only young men most were West’s juniors and they played for the greatest club of all West’s. At the young age of 28 Tony played his last game with West’s in 1974. 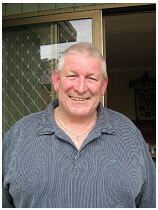 He had one season at Tumut, as captain coach and a final season at Wentworthville where Mick Alchin was captain coach. Barry Bryant also played at Wenty during this time. Tony now lives on the Central Coast with his wife and is in semi retirement. An ankle injury he suffered in 1974 has made it difficult for Tony to get around these days. Before I finish this story I would like to remember one game that Tony played in out of all of the 104 first grade games. The year ….1972… I was 19 years old…. the place the SCG. West’s played St George …it was a very hard game…. only seconds to go and Graeme Langlands puts a bomb up on the West’s line..The ball goes high its coming down under the posts a certain 5 points (that would make it 10-9 in favour of the old enemy)…cool as ever Tony Fred Ford (The Natural) takes the ball and the tackle… siren goes… game over West’s win 9-5 …back to Ken Owens pub. Thanks Tony for all the years you gave to West’s…. job well done.